… walk into a bar. These three women opened the restaurant in 1986 with Marna’s husband, Frank Brigtsen. 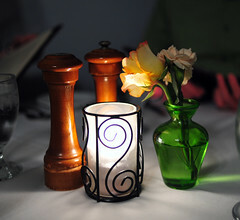 It was Marna’s night off on my recent visit to the restaurant. But Sandra was working the hostess stand, Rhonda was our server, and Frank was cooking. Run by a family, Brigtsen’s feels like family. And perhaps that’s why our meal here ranked so high up on my friends’ lists. 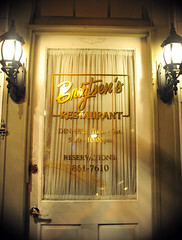 The general consensus among them is that Brigtsen’s was their favorite among the restaurants we visited on this trip to New Orleans. I can’t say that I agree, but only because I didn’t have a favorite. Like Brigtsen’s, all the restaurants we visited had their highs and their lows. For me, no one restaurant on this trip stole the show. But, after totaling the tallies on my own ledger, Brigtsen’s had a well-populated plus column. I can’t say that I walked out of the restaurant impressed, but I sure did walk out happy. The food here is Creole/Acadian, the cuisine of southern Louisiana. 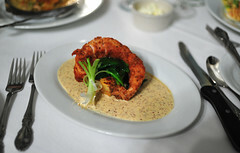 It’s not fancy, per se, but it’s fancy for Creole/Acadian cooking; comfort with class. It’s the kind of redefined refinement one expects from a James Beard Award-winning chef. By 2010 standards, Brigtsen’s food looks like it’s 15 years behind. It’s pretty clear that it hasn’t changed much, if at all, for a decade and change. But that matters little because the ingredients are of good quality, they’re properly handled, and, above all, the food here is truly delicious. Iggy, The Drummer, Houston, The Hair, and I ordered liberally, covering a good portion of the menu. CLICK HERE to see all of the photos from this meal, or click on the course titles to see the individual dish photos. Andouille Parmesan grits cake, spinach, & Creole mustard sauce. Satsuma, feta, spiced pecans, croutons, pickled onions, and cane-vinegar dressing. Smoked Corn Sauce, Red Bean Salsa, & Roasted Red Pepper Sour Cream. Asparagus and Fontina cheese grits. Save one dish – two, if you’ll allow me to be extra picky – the entire meal was in the plus column. The two soups – the “Filé Gumbo” and the “Butternut Shrimp Bisque” – were phenomenal. They were my favorites. The roux base for the gumbo was especially dark and immensely flavorful, a benchmark. 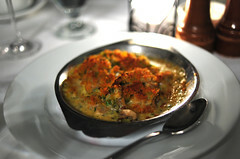 Thickened with a touch of filé, it contained delicious pieces of rabbit andouille sausage. The “Shrimp Remoulade” could have doubled for a Creole fiesta. Who knew guacamole and remoulade went so well together? Garnished with corn and chayote relish, this dish could have doubled for a light meal. In fact, most of the first courses could have been stretched with some bread to serve as a decent dinner. 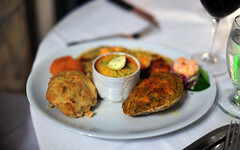 There was a wonderful, breaded “Rabbit Tenderloin” served atop a warm grit cake with creamy Creole mustard sauce, and a rich gratin with meaty chunks of artichoke hearts and plump oysters (“Oyster & Artichoke Gratin“). Both were homey and delicious. So was the “Sauteed Veal with Osso Bucco Sauce” with a side of Fontina grits, Houston’s main course. Incredibly tender, the schnitzel was smothered with an osso bucco sauce studded with what appeared to be nuggets of marrow. I quite liked the grits, which had a nice bit of texture to them. Solely a matter of personal preference, I can’t say I was terribly enamored of the mashed potatoes here, which showed up on nearly every main course. I like mine rough-hewn and unadulterated. At Brigtsen’s, they’re butterized and pulverized. Thick and smooth, I found them a bit too dense and gummy. I was equally disenchanted with my “Roast Duck,” the one true disappointment of the night. The sloppiness of the presentation aside, the deboned half duck with its skin on was overcooked – dry and tough. 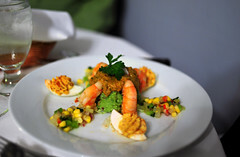 Perhaps Brigsten’s most famous dish was also my favorite main course, “Brigtsen’s Seafood Platter,” a.k.a “The Shell Beach Diet.” This mini-seafood buffet-on-a-plate includes six items that change from time to time. I only got to try two of them, and they were both spectacular. Sauced with a fragrant, rich pistachio-lime sauce, the drum fish was meltingly soft. The shrimp cornbread with jalepeno smoked corn butter had a soft, loose crumb and just the right balance between sweet and savory, with a dash of heat cutting through it all. As for being picky, there wasn’t anything wrong with the “Blackened Yellowfin Tuna.” A relic of the nineties fascination with the seared and raw, there was nothing great about it either. Accompanied by a well-rounded list of southwestern condiments, I found the dish surprisingly flat. The service here might have been the best part of our experience. Rhonda was as sweet and thoughtful as Frank Brigtsen’s “Pecan Pie.” She really couldn’t have been more pleasant or mindful – even holding my second first course – the “House Salad” – chilled while I ate my other one. 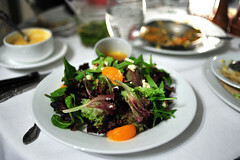 Like a well-timed magic show, as soon as I made the rabbit disappear, she arrived with my salad, a wonderfully composed combination of sweet, tart, crunchy, spicy, creamy, and savory. It was a refreshing tail to a rather heavy start. 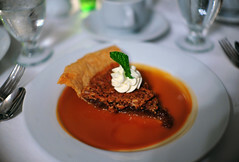 More thin than thick, more nut than filling, that slice of pecan pie appealed to my crunch-craving side. The higher crust and nut-to-filling ratio also tempered the sweetness – like Rhonda, it was endearingly sweet, but not cloyingly so. 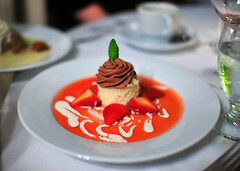 Like the food, the desserts here are homey and simple, the nostalgic kind that are able to disarm my oft-cerebral tastes. The “Strawberry Shortcake” boasted a moist, fluffy biscuit with a nice crust and a fluffy cloud of whipped cream floating in between. 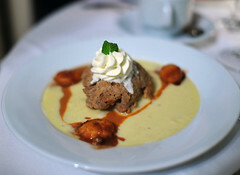 The “Banana Bread Pudding” was warm with winter spices, a comforting dome rising from a delicious banana cream sauce pinned with three molten banana slices coated with a dark bananas Foster-like caramel. There might have been a bit too much overlap between the the “Strawberry Tres Leches Cake” and the shortcake. And the tres leches cake might have enjoyed a longer bath (it was drier than tres leches should be). But, overall, it was a decent dessert. With a chocolate whipped cream hat and a scarlet skirt of strawberry syrup, it was a cake version of Neapolitan ice cream. 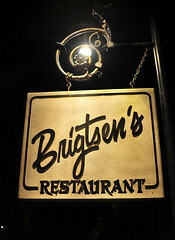 The most surprising thing about Brigtsen’s was Brigtsen’s itself. The restaurant lives in an old house. I won’t go as far as calling it frumpy, but the interior is certainly dated. Your great-grandmother might call it modern (and she’d probably insist on replacing the cracked glass on the front door). But there’s a coziness to eating in an old parlor that fits tongue-in-groove with the familial food and service you’ll find here. As much as I bristle at the thought of the decor, I’ll admit that it has a charm that’s essential to the restaurant’s personality. Though it’s a world apart from how I had pictured the restaurant, now having been to Brigtsen’s, I can’t imagine it any other way. 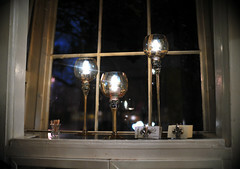 A spot of housekeeping: Brigtsen’s is located a good ways from the French Quarter, where we were staying. (Click here for directions). We could have taken the streetcar, but it being cold and rainy, we piled into a cab. Getting back was a bit hairy. We had asked for a cab to be called, something that Sandra is used to doing, apparently. We being five, a four-door cab wouldn’t do, so we had to wait for a van. The Saints’ victory over the Cardinals earlier that day probably had something to do with our forty-minute wait, during which we shuttled between the small reception landing inside and the porch, where we burned off some of our calories in the cold bidding goodnight to the stream of guests hopping in the arriving cabs. Sandra couldn’t have been more apologetic or kind. ~ by ulterior epicure on February 12, 2010. @ Michael: Have a good time. Are you going alone?